I work part-time in a vintage shop in my cities downtown area. I don’t work for the money as much as I work because I am a social animal and I need the interaction. 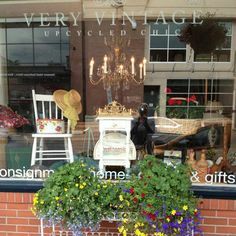 Throughout my career in retail sales I have sold everything from snow cones to high end furniture and now I am enjoying selling vintage and antique housewares. F.Y.I. Vintage is considered 40 years or older. Antique is considered 100 or older. So yes, some of you who are reading this are in fact vintage. Me too. As a professional sales person with over 35 years of experience in retail, I do my best to learn as much as possible about the inventory the business stocks in order to be able to inform the customer about the products I sell. But with vintage, everything is unique and I find I am constantly learning about the fascinating history of our stock. This is one of the delights of working with old stuff but I never thought that the inventory of the shop would teach me a thing or two about life. The stores owner uses this term regularly when describing an item that is showing signs of wear or is damaged or flawed in some way. As a recovering perfectionist this is an amazing term. In the western world we have become focused on only things that are perfect and discard items we deem as being broken. We have become a throw away society. Through consumeristic marketing ploys we have been conditioned to dump the old and buy the new and improved instead of repair and reuse what we already have. Even people who are not considered beautiful, outwardly talented, or may fit into what is considered the social norm are marginalized to the edges in this society. But does that make them useless? When you think about it, very few things in this world are perfect. Most perfection belongs to nature and even then the ravages of time render natures beauty fleeting so I have learned to embrace the perfectly imperfect. We all have a few dents and scars from usage. Look past them and see what lies just under the surface. You may just find a hidden treasure that is rich with potential. As I mentioned above, a vintage shop is full of one of a kind items. The older the item, the less of the chance of finding another one like it again. Mass marketing and producing items in the millions is a phenomenon that really only got started in the 50’s and 60’s and if you are looking for an item that may have been used in the past everyday the odds of the majority being worn out goes up considerably. Yet I am amazed by the customers who finally find that one item they been looking for only to hesitate to buy it. Then when they come back at a later time to purchase it, they are disappointed to find it sold. The four most dangerous words when vintage shopping is, “I’ll think about it.” Hey, even I have done the very thing I warn customers against and then mentally smacked myself when someone brings up to the counter to buy the very item I was “thinking” about. It’s the same in life. If opportunity knocks and you been waiting for the chance, you need to take action. Don’t think about it. Don’t worry about making a wrong decision. You’ve already thought about it enough and that’s why you’ve been looking for it in the first place. Grab it with both hands and don’t let go. This is actually a scientific fact. It has to do with bone china or porcelain being a non porous material that does not absorb the subtle flavours of a tea plus the tea cup’s wider, thin edged rim allows tea to flow off the edge onto your pallet as your nose takes in the splendid aroma somewhat like how wine does when drank from a wine glass. But for me the statement that tea tastes better in a tea cup is more a metaphor for enjoying the simple pleasures of life. When was the last time that you actually took the time to purposely brew a proper cup of tea? To take out your teapot, to let your favourite tea steep inside, wrapped in the comforting warmth of a tea cozy while you patiently wait with a beautifully painted china tea cup, maybe a matching creamer and sugar bowl and a plate of decadent cookies. When was the last time you did this while enjoying an afternoon visiting with a good friend or wrapped in a handmade afghan immersed in a page turning novel as the rain pelted outside. Do these words conjure up images of a slower, more luxurious pace of life? Taking the time to enjoy tea in a tea cup is a simple ritual that in todays fast paced world has become a dying extravagance. It’s probably why coffee has taken over as our afternoon break time beverage of choice. Drive up to a window and grab a paper cup’s worth of java and head back out onto the speedway of life. Can’t do that with a cup and saucer….. and that’s my point exactly. The thing is, when you embrace vintage, you embrace a way of living that is slower, unique and imprecise. You open yourself to seeing the flaws of life as marks of experience. You enjoy and take advantage of the found treasures that enrich you and you celebrate with them using simple rituals that create a purposeful way of life. For me, those are lessons worth learning. You are welcome Rainbow Girl! So, I’m vintage? That sounds so much better than old!